Make a difference to the lives of women in the UK who suffer from endometriosis - volunteer for Endometriosis UK. Our volunteers are at the core of our organisation. They make up our Support Network, which allows us to reach and make a difference to women struggling with the effect that endometriosis has on their lives. Without our Support Network volunteers, we would be unable to reach the thousands of women who rely on us for support and information. Being a group leader can be incredibly rewarding. Besides helping others and offering much needed support in your community, it enables you to become more involved with Endometrisosis UK's activities. Find out more. The forum is an important part of the charity's ability to provide information, support, a sense of belonging and community to women with endometriosis all over the country. Volunteering as a moderator is a very rewarding way to help others by using your knowledge of endometriosis and occasionally your own experience. Find out more. 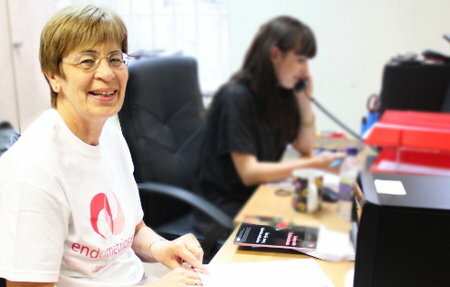 The Endometriosis UK Helpline is a vital part of our volunteer Support Network. It offers women with endometrisosis a chance to talk about their feelings and experience to someone who knows exactly what they are going through. The rewards of being a Helpline Volunteer are very special-knowing that you have helped a caller can be immensely satisfying. Find out more. Endometriosis UK's Online Support Groups take place each month online via a 'webinar'. The purpose of these groups is to provide support and information to women who don't have access to a local support group and feel isolated. Find out more. For our current office volunteer vacancies please see our Working for Us section. ​If you are interested in volunteering in our Head Offi​ce in London, or if you have specific skills you think would be of benefit to the organisation, please contact admin@endometriosis-uk.org with a short description of your skills and how you would like to get involved.